OKLAHOMA CITY (May 7, 2014) – Testing season can be a stressful time for students, but a number of innovative teachers throughout Oklahoma have tapped their creative energies to make the experience fun and interesting for their classes. 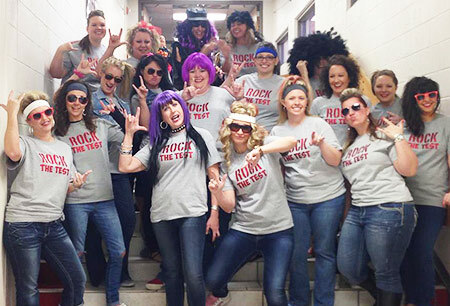 At West Elementary School in Weatherford Public Schools, teachers got their fourth- and fifth-grade students pumped up with a “Testing Pep Rally.” Teachers donned brightly colored wigs and “Rock the Test” T-shirts for an assembly in which they strutted their stuff to Queen’s “We Will Rock You” and other adrenaline-charged songs. A couple of high school seniors gave the kids tips on how to be ready for tests. “We just tell the students that you’ve been taught everything you know. Do your best and you’ll be fine,” said principal Ryan Lauder. That wasn’t all. Kids who arrived at school by 8 a.m. were eligible for drawings for prizes such as Frisbees, hula hoops and sidewalk chalk. Students also found encouragement through an array of posters that lined the halls. “It truly takes a village to take the test at Coolidge Elementary,” said Coolidge principal Annette Williams. At Hilldale Elementary in the Putnam City School District, things have gone to the dogs — at least in the third-grade classroom of Bobby Rockel. When some of his students expressed anxiety about the tests, he hit on the idea of motivating the kids by urging them to release their inner bulldog. In Tulsa’s Union Public Schools, teacher Samantha Gross was brave enough to dive into the songbook of Disney’s hit movie, Frozen. The following morning, Gross showed the video to her students — after first closing the classroom door, of course, lest anyone else hear her Princess Anna imitation. The kids were delighted. Little did Gross realize at the time that her husband had posted the video on YouTube.